The first edition of The Anderson Courier is just hitting the newsstand, courtesy of our very own news reporter, Natalie! 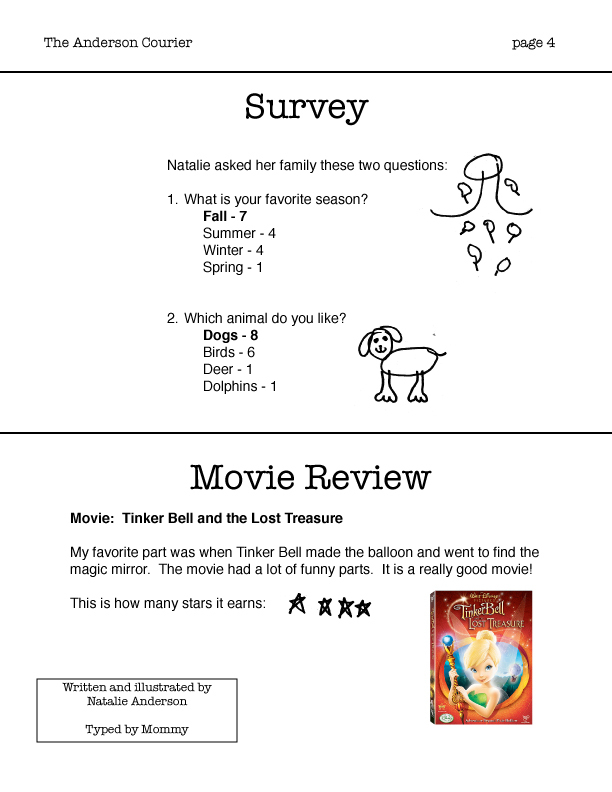 Natalie has been hard at work writing and illustrating her first newspaper with articles, interviews, jokes, movie review, recipe, and more. After reading Some Good News (the 4th book in the Cobble Street Cousins series by Cynthia Rylant), Natalie was inspired to create her own newspaper just like the cousins in the story did. We brainstormed together what types of stories and features a newspaper might include. We also looked through our local newspaper for ideas, although I had to carefully choose the “kid-friendly” stories/sections for us to look at! We talked a little about including who, what, when, where, why & how in our stories, but I didn’t go into a lot of detail with this since she is still a beginning writer. She dictated; I typed and formatted. We printed out a dozen or so copies to deliver and mail to family and friends. She is so proud of her newspaper, and I can see us making another one again in the near future! A couple books we enjoyed from the library while working on this project were Deadline! : From News to Newspaper by Gail Gibbons and Fairytale News by Colin & Jacqui Hawkins (it comes with a “real” Fairytale Newspaper tucked in a pocket in the back of the book!). Amida at Journey Into Unschooling shared a fun newspaper project, too – a Civil War newspaper called the Union Bugle. Check it out! 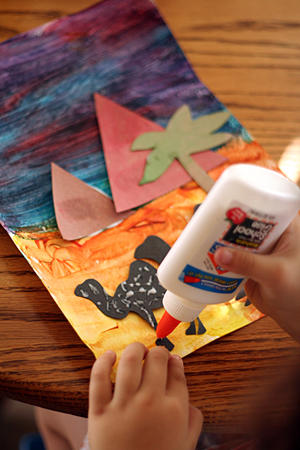 Have you made a newspaper with your kids? I’d love to hear all about it! Tip of the Day: Ask your child to write a journal entry or book report in the style of a news article – don’t forget a catchy headline! A few weeks ago, we checked out a book of Mother Goose nursery rhymes from the library. Delaney was really interested in reading and reciting them, so I thought I would use them as a jumping-off point in our school work. She is loving it! Even Natalie has been joining in for many of the activities – she couldn’t resist! 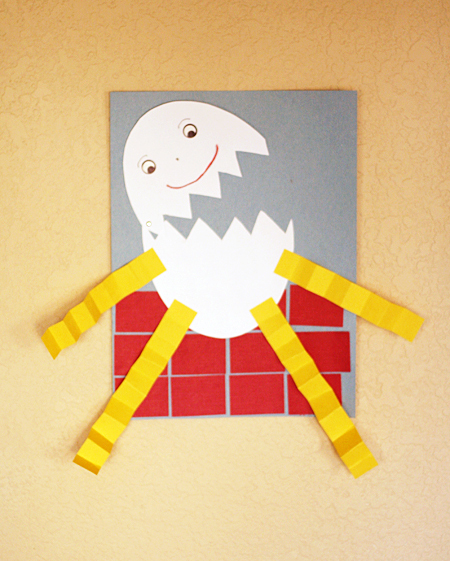 First up – Humpty Dumpty! 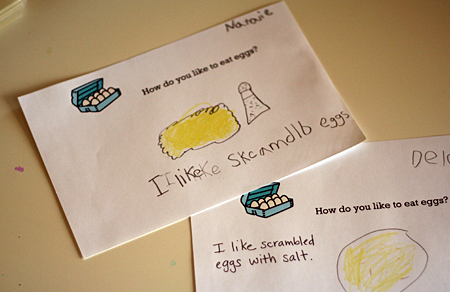 Writing: How do you like to eat eggs? 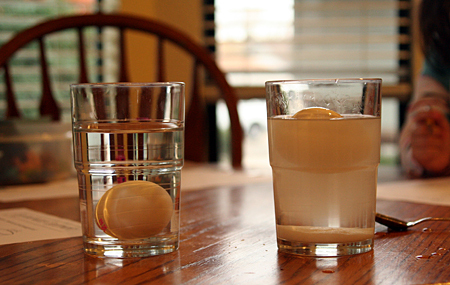 Experiment: What will an egg do in fresh water and salt water? 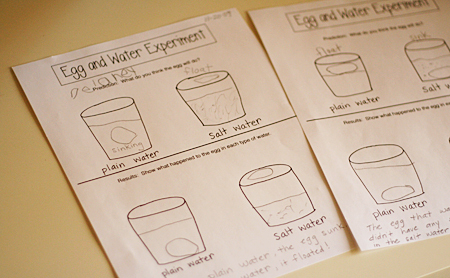 (Our salt water solution was approx. 1 cup of water and 6 tablespoons of salt.) The girls were totally amazed by the floating egg! Egg hunt! I pulled out the plastic eggs and Easter baskets (so fun in the off-season!) and hid eggs filled with coins. After finding their eggs they sorted and counted their coins. 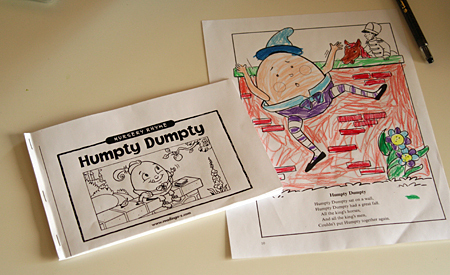 We had so much fun with Humpty Dumpty! Here’s a simple dice game for practicing addition called Numberbow. It comes from a great book called Games for Learning by Peggy Kaye. You will need a game board shaped like a rainbow and divided into 11 sections. 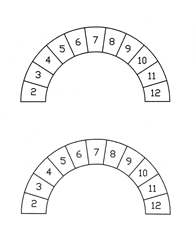 Number the sections from 2 to 12. 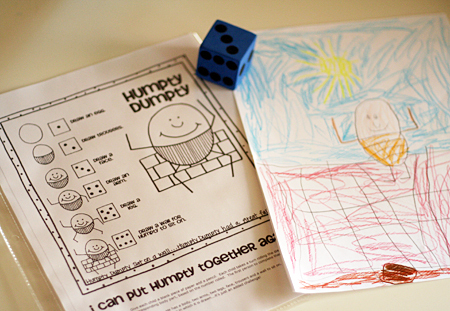 Playing is simple – roll two dice, add them together, and color the sum! This can be played competitively, with two or more players trying to fill their boards first. 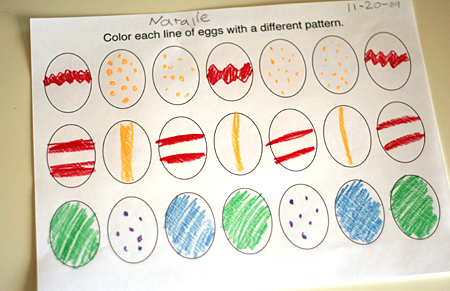 Or, it can be played individually – this is actually one of my girls’ favorite math activities. Delaney, my five-year-old, still counts the dots to find the sum. I can make it more challenging for Natalie, age 7, by giving her dice with numerals instead of dots. A fun break from math fact worksheets! 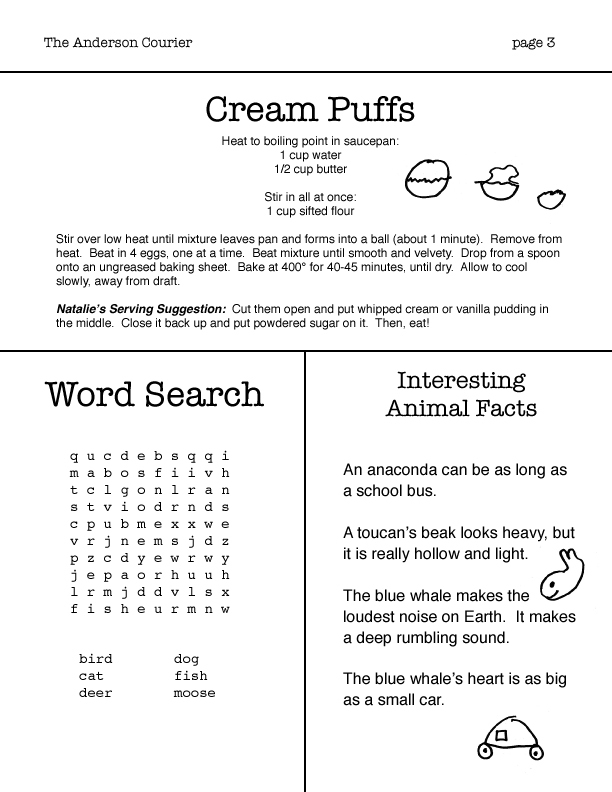 If you would like to save yourself a few minutes of prep, here is our page you can download and print: Numberbow. You could put this in a sheet protector (or laminate) and color with dry erase markers, too. Have fun adding and coloring! 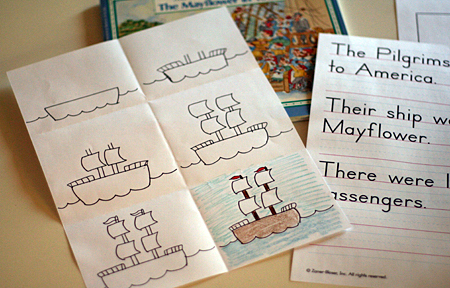 Mayflower drawing and copywork – I meant to order the Draw Write Now book that has the Pilgrims and Native Americans in it, but I never got around to it. So, the girls have to use my how-to-draw instructions – they might not be the best, but they’ll do! I printed out a few facts (using the handwriting worksheet tool at Zaner-Bloser) and the girls can pick one or two to copy. I’d love to hear about your Thanksgiving activities, too! Natalie is not a big fan of invented/phonetic spelling. She’ll do it, but she doesn’t really like it! We recently made her a personal word wall in a file folder. I always had a word wall in my classroom, and as I introduced sight words, we would add them to the wall. So, this is just a mini-version of that. Natalie can already read all these words, she just can’t remember how to spell them. This has been a great tool for her. She always uses it during journal-writing, but I have also noticed her pulling it out to use when writing letters and notes. For now, I am adding words mostly at her request. Sometimes, we look back through her journal and find words she uses often, but misspells. She loves it and I can tell it makes her feel more confident when she writes. Anybody else use a word wall, word folder, or other word bank system? I would love to hear your ideas! As a kind of grand finale to our study of Ancient Egypt, the girls decided to make their own board game. It was a great way for them to review all the things they had learned, and to revisit maps, books, and other projects we had done. 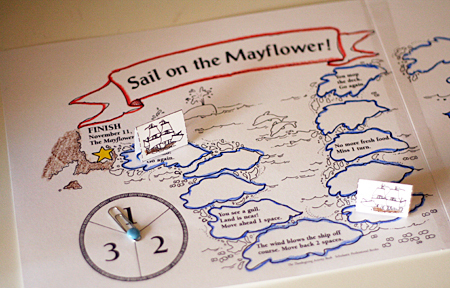 Game Board: They drew and decorated the game board inside a file folder. The “waves” on the Nile River are the spaces for moving toward the Mediterranean Sea. Tokens: They made boats from Sculpey clay – enough for all four of us to play together! Game Cards: The girls created cards that had either information or a question, along with spaces to move forward or back. I typed them into the computer and they helped choose clip art to decorate. I asked lots of questions to help them remember all the things we had learned! They are SO proud of this game, and it has been a frequent choice for playtime. Fun stuff! Tip of the Day: What is your child learning about right now that could be made into a game? 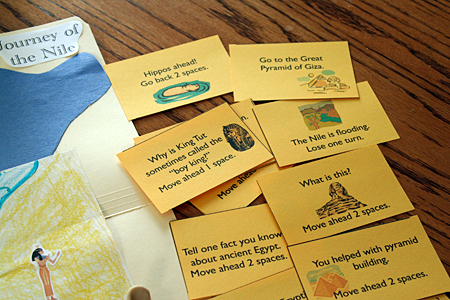 A handmade game gives your child a sense of pride and ownership, plus repeat playing means more learning! My girls are all about the art projects these days, so of course, we had to do something to go along with our study of Ancient Egypt. 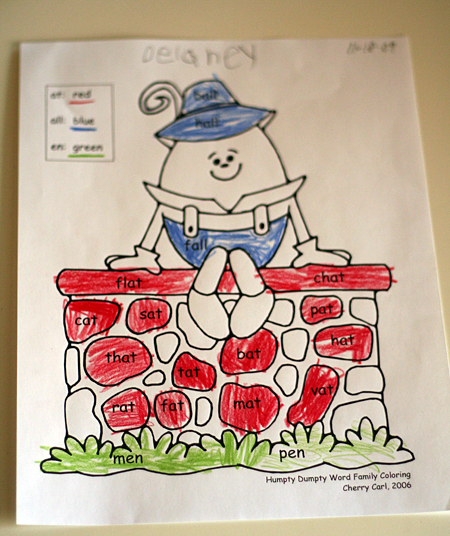 I found the idea for this project on the Crayola website and modified it for the supplies we had on hand. 1. Draw a horizon line and paint the background. I put out three colors of tempera for the sand (orange, yellow, brown) and three colors for the sunset (blue, red, purple). I encouraged the girls to load their brushes with more than one color at a time. 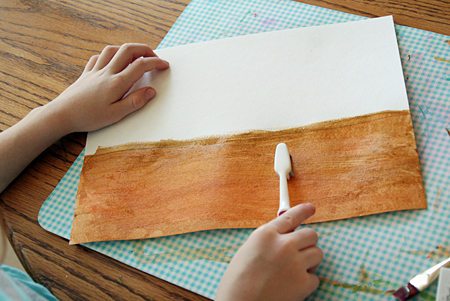 We also used an old toothbrush to create some texture for the sand. 2. Cut pyramids, palm trees, or whatever you like from cardboard. 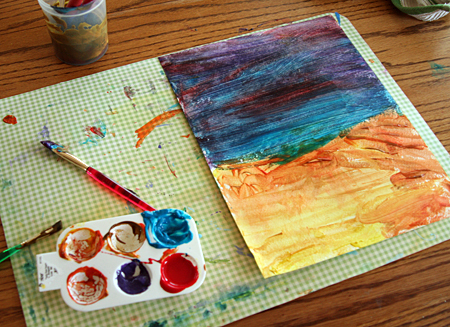 Paint with watercolors for nice, muted sunset-y color. 3. When your background and cardboard pieces are dry, do some gluing. 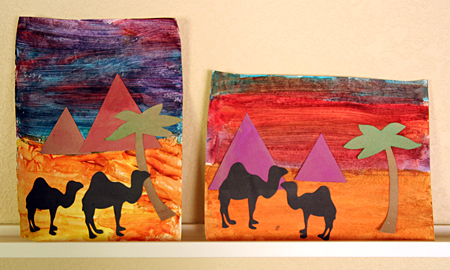 Add a couple camels cut from black paper, too, if you like! 4. Enjoy your Egyptian masterpieces! I have been introducing Natalie to a lot of different games that require her to practice her addition facts. Pyramid Solitaire is a great way to practice sums of ten in a fun way. Plus, we’ve been learning about Ancient Egypt, so anything shaped like a pyramid is perfect for us! Line up your cards in six rows, as shown below. Put the remaining cards in a stack face down. 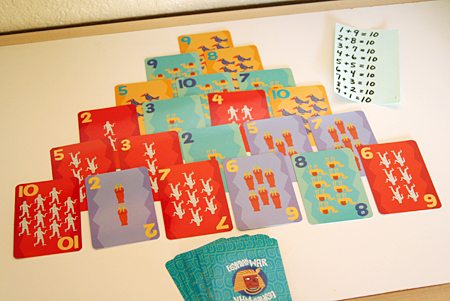 The goal is to remove cards from the pyramid, in pairs that add-up to ten (or ten by itself). Only cards that are fully uncovered can be removed. 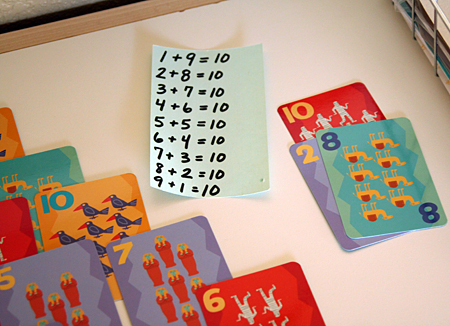 Once you have removed as many sums of ten as you can, turn the cards in your stack over one at a time, using the card if you can to make a sum of ten. Can you clear the entire pyramid? Natalie started with an index card “cheat-sheet” of all the sums of ten. After playing a few times, she was remembering the sums without having to look at the card – just what we were working toward! Tip of the Day: Drill-work and memorization does not have to be boring or tedious – many card games and board games incorporate all kinds of math skills in a fun and engaging way! Learning to write letters and numbers can be frustrating for little hands! 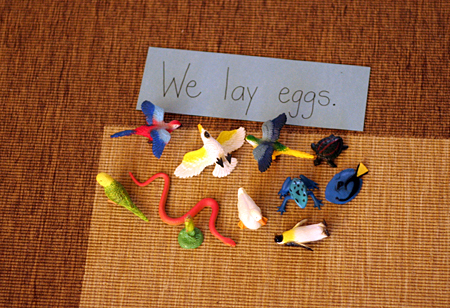 I like to offer lots of play activities that help build those fine motor skills in a relaxed, fun way. 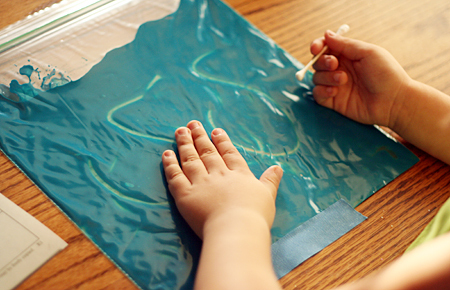 Toddlers and up will enjoy making shapes, swirls, and even letters on a plastic bag filled with paint. 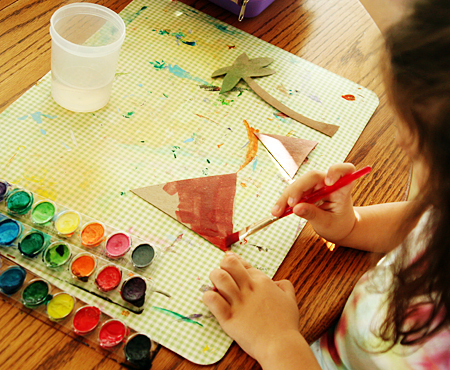 To make your own paint bag writing tablet, put some finger paint or tempera paint into a sturdy freezer zip-top plastic bag. Seal it well and smoosh the paint around the entire bag. (You could even add a strip of packing tape across the top if you are worried about your child opening the bag.) That’s it! We like to tape ours down to the table so it doesn’t wiggle around too much. Try doodling and writing with your finger first. Your child may also enjoy using a cotton swab to write with. When your tablet is full of scribbles (or sight words for older kids), smoosh and smear the paint around and start over. No mess, just fun! My kids love playing tic-tac-toe – it’s one of those simple boredom-busters for restaurants and car rides. Natalie and I have been using tic-tac-toe to practice her addition facts. You have to solve the problem before you can put your marker on the space! other types of math problems – subtraction, multiplication, division, fractions, money counting, etc. 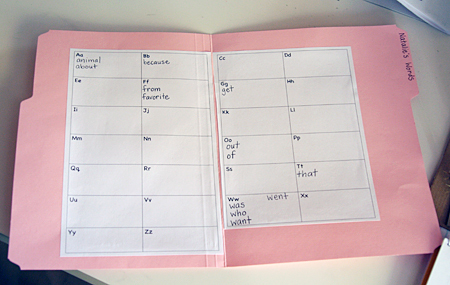 When I taught second grade, we also played a version where I filled each space with a word spelled incorrectly. To put a marker on the space, the student had to correct the word first. So much fun! Tip of the day: Choose a simple game that your child likes to play – Go Fish, Checkers, Tic-Tac-Toe, Hide & Seek – and think of a way to incorporate a skill that needs practice.